Home › Shooting Percentage › How much skill exists in on-ice shooting percentages? How much skill exists in on-ice shooting percentages? Earlier today, Phil Birnbaum posted a piece offering further arguments in favour of his view that shot quality exists and is a legitimate strategy choice for teams. For those of you unfamiliar with Phil’s work, he’s long been a proponent of the idea that teams can sustain high shooting percentages, and while I’m not necessarily in agreement with all of his theories, the points he makes are generally well thought out and argued (all of which is to say that regardless of where you stand on the topic you should read what he’s written to date). In his article Phil made two main arguments: first, that players have the ability to increase their teammates shooting percentage while they’re on the ice; and second, that because of this we can conclude that team shooting percentage isn’t random. I’m not going to dig too much into the second argument, as that’s not something that’s ever really been argued by any analyst (most claim that while shooting is a skill, at the team level the differences are frequently so small that they’re negligible), and I think that the salary cap structure and the fact that teams tend to pay for past Sh% may explain why the differences we observe are small. I do, however, want to look into Phil’s first claim, that players able to influence their on-ice shooting percentage. The main evidence that Phil offers in support of this argument is that for a set of elite players their ability to maintain a positive On-Ice Sh% WOWY persists year-over-year. While this finding certainly supports his point, it’s far from conclusive: after all, his analysis focuses on 10 players and we can’t really reach broad conclusions based on 1% of the leagues population. Furthermore, several of the players he highlights are excellent shooters themselves, and what we’re seeing in their on-ice shooting percentage may be more of a reflection of their individual shooting percentage than any goal creation ability. Lastly, all of these players are amongst the best in the league and tend to play with the other very good players: any year-over-year trends we see may be more reflective of consistent top-level teammates rather than ability. With all that being said, I do believe that there is skill in on-ice shooting percentage, it’s simply a matter of how much talent there is compared to luck, and how persistent it is in season-by-season numbers. To investigate this, I pulled all the individual seasonal data from stats.hockeyanalysis.com, and calculated each player’s Individual Corsi Sh% (iCSh% = iGF/iCF) and their On-Ice Teammate Corsi Shooting Percentage (TMCSh% = (GF – iGF)/(CF – iCF)). After filtering out anyone who wasn’t on the ice for at least 200 CF in a season, I split the data between forwards and defencemen and calculated the correlation in both iCSh% and TMCSh% over several seasonal pairs (i.e. correlation between year y and year y + x for x in [1,6]). By looking at the correlation over multiple years we should be able to figure out the extent to which similar teammates/deployment factors into each of our metrics repeatability. Starting with the forwards, we see that our results do seem to align with Phil’s theory – the correlations for iCSh% never drop below 0.2, and average roughly 0.22 if we exclude the last datapoint which seems to be way out of line. Similarly, forwards seem to have at least some ability to influence their teammates shooting percentage, with the correlations averaging 0.18 for up to 5 year differences. 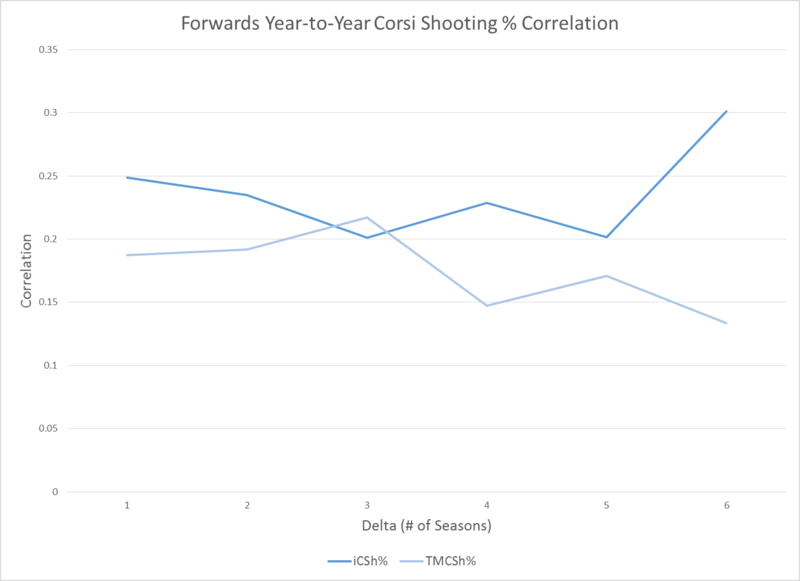 And while none of the correlations that we see are phenomenal (as a point of comparison CF% generally correlates at levels between 0.33 and 0.57 over 5 years for forwards), there’s very clearly some talent there. What we see also makes a lot of sense intuitively – forwards have more control over the shots coming off of their own sticks, but we expect that they should have at least some ability to create scoring opportunities for their teammates. For defencemen, on the other hand, we see a much different story. 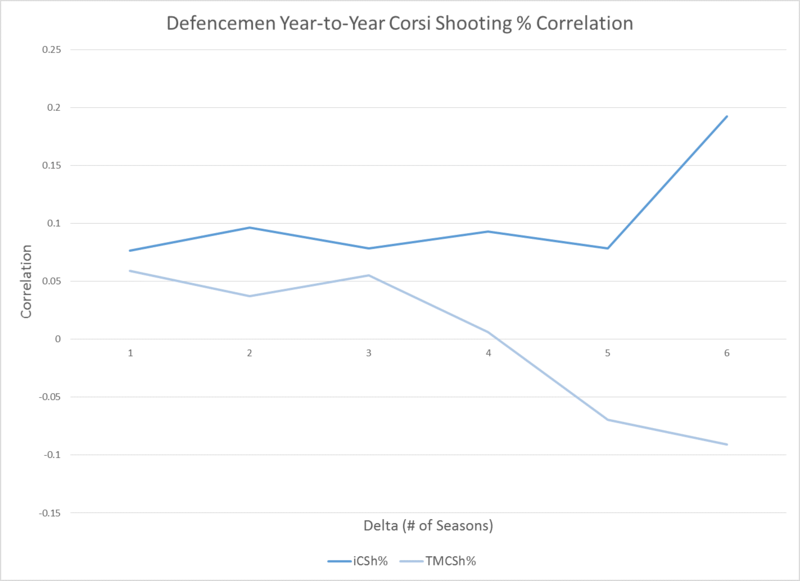 Defencemen show little repeatability in individual shooting ability, with the correlation generally sitting in the 0.08-0.10 range (again, with the exception of our odd 6 year delta seasons). When it comes to improving their teammates shooting, however, the picture is even worse, with the correlation dropping to roughly 0.06 for a 1 year delta, and down to basically 0 at lengths more than 4 years. While it’s not exactly news that forwards drive offensive play more than defencemen, this really underscores how little control defencemen have once the puck leaves their sticks. This helps explain (in part at least) why it’s so difficult for a defencemen to look “dominant” for multiple seasons at a time, since so much luck exists in their year-to-year shooting percentages it’s really tough to get the bounces to go your way for multiple years at a time. And while forwards do show more control of whether the puck goes in when they’re on the ice, a single season’s data is still about 75% luck for their own shots and 80% luck for their teammates. All of which is to say that while generating and converting on scoring opportunities is definitely a skill for forwards, it can take quite some time before we know if what we’re seeing is signal more than noise. We needn’t ignore shooting percentages, but rather we need to keep in mind that bounces can take a long while to even out, so if you’re seeing names like Chris Neil near the top of the league in shooting percentage (19th at the moment!!!) it may be a sign that it’s too early to be checking the data.